"I added cinnamon flavor to a old bran favorite." In a large bowl, combine bran flakes, flour, brown sugar, baking powder and cinnamon. Stir in buttermilk, butter, and vanilla. Fold in cinnamon chips. Spoon mixture into prepared muffin cups. I used sour eggnog and it was also a nice flavor enhancement. They were a huge hit at the office and I'll make them again! I loved this recipe,moist and yummy. I will only use 5 ounces of cinnamon chips next time- the entire bag was too much! Great recipe! Very yummy and easy to make. 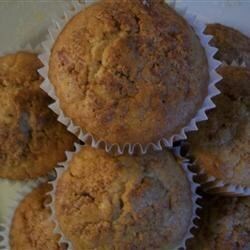 I have to say this is the best bran muffin recipe I have ever made AND tasted!! The cinnamon gives these muffins a delicious flavor, and the buttermilk adds an incredible moistness!